The Burra Basement beer as I call the Unicorn Brewery has been up and down since it’s creation in 1872, closure in 1902 and subsequent reopening in 2008. The brewery used the old underground storage facilities in Burra to produce their beer but these days the beer is brewed by contract out of an unknown Sydney brewery and shipped into S.A. The beer pours as a cola colour with a tan head. Upon dipping my nose into the froth I got a lot of sweet malt at the start, the end dipped into a bitter finish. The first sip is really good if you enjoy the coffee bitterness, it’s not as harsh and unforgiving as it could have been because it get’s off set by a degree of malt . The biscuit of flavour is surrounded by a rich chocolate and coffee flavour that might turn any lager lover off but is considered standard for a porter person. The bitterness is not overpowering and in fact I found that the flavours while present were a little muted or dialed back . It is not a ‘big’ stout but at 6.2% it is not a session beer, if you want that go for a dark ale. Conclusion: there are better stouts on the mark for the same price but something about the heritage and the history of the Unicorn would mean I will continue to support it, their pale ale is better though. 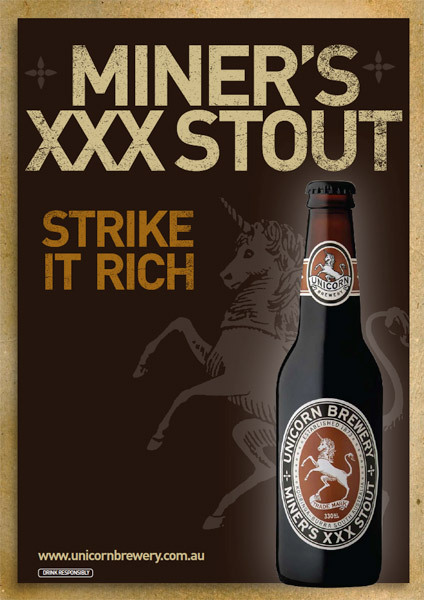 Unfortunately they seem to have hit some supply issues and the only bottlo that carries the Miner’s stout at the moment is at the Burnside Village, still it is worth a try if you don’t mind stouts.